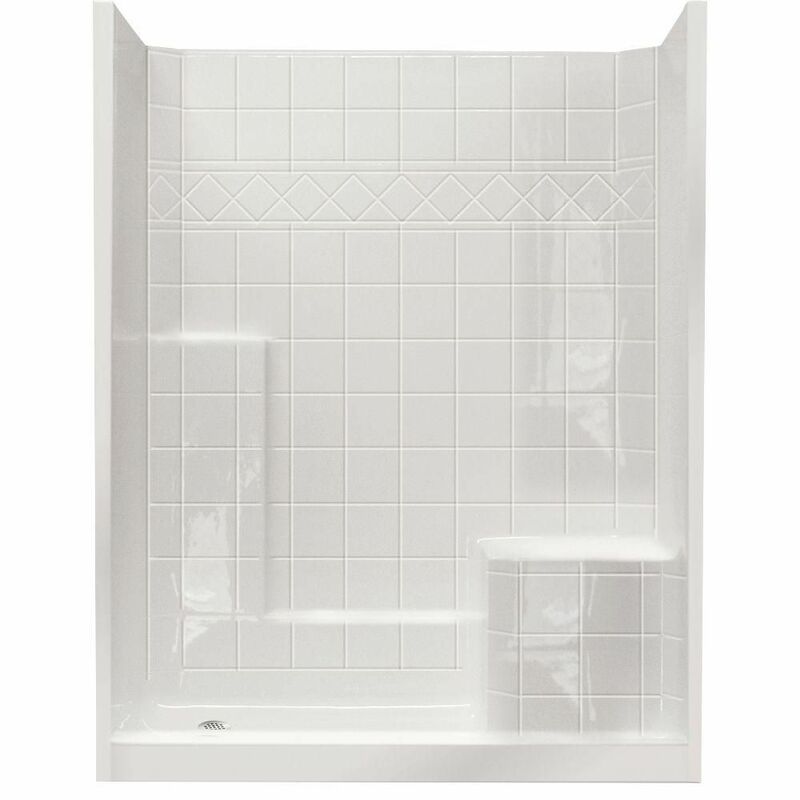 Standard 32-Inch x 60-Inch x 77-Inch 3-Piece Shower Stall in White is rated 3.4 out of 5 by 10. Rated 3 out of 5 by Cliff from Some Problems My installation contractor had problems with the base. The front flange had been cut 4-1/2 inches wide on the left narrowing to 3-1/2 inches wide on the right - see photos. He had to build a solid wood frame uner the base to fully support it. The installed unit looks great but I was not happy with such a quality flaw. I would appreciate a rebate on what I paid expecting the advertized quality. I notice you now have this unit on a sale price. Rated 1 out of 5 by captken from After test set up of the unit, at... After test set up of the unit, at which time appeared to be satisfactory, I proceeded to tear out the old tub and tiles. I realized that the flanges were different thickness and were not cut even. Also, I was missing alignment pins. I also noted that the underside was not ground for a finish fit; only the roughness was knocked off at the factory. Once I got it together, it appeared that the front panel bulges just above the seam for the base. I took a great deal of time to assure alignment and evenness. Then it came time to remove the stickers which must have been on for a long time as they did not peel off. The area under the sticker was a different color. There was also a foot print on one of the side panels where some one from the factory stepped on the panel. Needless to say, I spent a lot of money for this product and did not get what I paid for. Quality control from the factory is very poor. Rated 1 out of 5 by CW from very poor This shower unit is one of the worst I have installed and I am an experienced installer. It doesn't matter if its new construction or a remodel, the installation is difficult. The directions are limited, the contact number in the owners manual is for a life insurance company, There were parts missing, and customer service was not helpful. The vertical seam is totally reliant on silicone to keep water from getting behind the shower, the pins don't line up, and you truly need to be able to get to all four sides of this shower for a less painstaking installation. The design is horrible and quality of the unit is less than good. I usually do not write reviews, however I felt that some may find this information helpful. To sum up, I would not recommend this unit even if it were free. Rated 5 out of 5 by Patsy from Excellent! My neighbors wish they had one! I love it. The seat is great. Rated 3 out of 5 by nuge7561 from Shower pegs not matched Installation instructions not helpful for this size shower kit. Showers walls did not align well with lower shower base. May work well for new construction but difficult for re-modeling.